Sea Urchins are found in oceans all around the world. they sting and can be your nemesis. 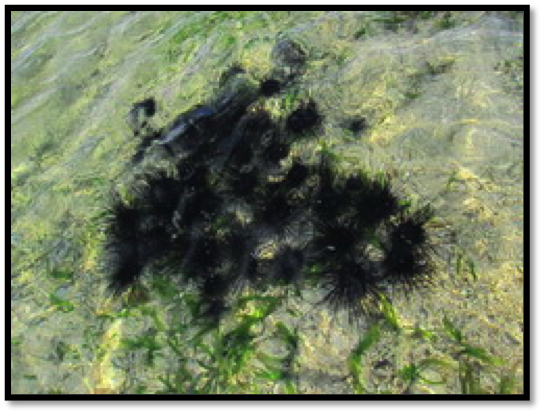 Sea Urchins are the reason why a lot us wear reef boots to protect our feet. Floundering (insert trying to look like a pro here!) on the reef trying to get in or out of the water is when I’m most at risk of getting nailed. Put your hand down on the reef (be it coral or rock) and you’re asking for trouble. The only way to deal with urchin injuries is to tackle the poison and foreign body issues before you can sort out the wound. Before I go into treatment I need to explain the grave (as in they could put you in one!) points for these issues. Poisons can really sting, paralyse and kill. Local dive shops are a good resource for info on dangerous marine life. There are about 10 sea urchins that have poison and there are a few deadly ones. 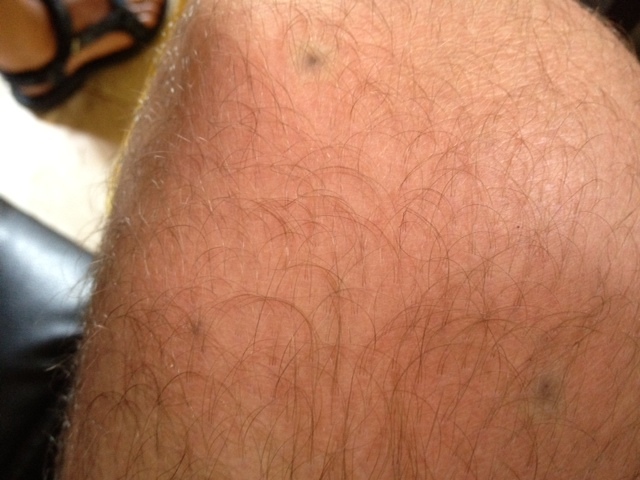 You’ll know soon enough which one you’ve caught yourself on..
You can be allergic (anaphylaxis) to sea urchin poisons. Feeling unwell, looking blotchy, red, finding it hard to catch your breath (wheeze) and tongue swelling are signs of this. Don’t be a hero. If this happens getting to hospital fast is your only priority. You need oxygen, IV fluids, IV hydrocortisone, antihistamines and adrenaline injected into a muscle. This is not a cool way to die. You’d be seriously unlucky to react like that. If you’re like most of us your reaction will just range from no pain to a ferocious sting! Injuries to tissue from sea urchin spines can be quite severe. They can swell, become red and inflamed. They can become extremely painful and are prone to infection which if allowed to can spread in the blood around the body and make you pretty unwell. Uncontrolled infections can kill. If you think there is a chance you’ve broken a bone underneath the wound, or a sea urchin spine could have worked its way into a joint space you need to get to a hospital as soon as possible to have the area surgically cleaned. It’s not a rapid emergency like anaphylaxis, but don’t hang about. This isn’t something you can take lightly as we’re talking about losing bone is you don’t. If you’re not sure, don’t be a hero. You should make plans to go to a medical center where they can have a look at you and sort you out. KILLED BY A FOREIGN BODY. NOT THAT ROCK N’ ROLL! Sea Urchin spines break off as they damage your skin. If they are allowed to stay in/under your skin they are a source of bacteria and are foreign. Your body will start to react against them. Locally this will make the area become tense, inflamed, hot and very painful. Pus is likely to collect around the spines and form an abscess. If you’re unlucky this can then make you really unwell as the infection spreads around your body. Checking lymph node tenderness or swelling (groins for legs, arm pits for arms) may indicated spread of infection but is not at all reliable. It may be useful to also read our article on coral cuts and wound management & surf injury. The following is what I consider minimal care of an sea urchin injury. I’m going to include the steps to help with alleviate problems with poisons. Remember that this is to increase your ability of being able to be in the water for the rest of your trip, and to reduce your chances of becoming unwell. The best management of any skin injury would be to keep out of the water until its healed and to seek medical expertise in its treatment. To do anything else is at your own risk. Soak the area in hot drinking water for at least an hour. Soak in a bowl or use wet cloth. The water should be as close to boiling as can be tolerated without causing burns. Add salts to the boiling water if you can or a few drops of Betadine solution. The heat will break down the poison and help with the sting. It also makes the area swell and soften a bit and make spine removal easier. Repeat as much as needed to help with the pain. Acidic solutions such as vinegar can be used as a substitute for hot water in breaking down the poison, but isn’t as effective in cleaning and softening the area. Use clean (Boiling water) tweezers, safety pin or needle to carefully work out ALL the spines you can see. Believe me. This can be really uncomfortable but is really important. Your mates will love it as they get to torture you with a needle. Make sure they’re being careful and not doing more damage than good. Try reminding them it could be them tomorrow! Use shaving foam over the area and gently scrape with a clean razor. I haven’t done this myself but I’ve been told by a couple of people that this is a very effective way of removing the small claw like bits of the Urchin snagged on the skin that contain the poison. If your wound isn’t stinging the chances are you haven’t snagged on a poisonous Urchin and you can skip this step. Scrub. This is a really important step and will be uncomfortable. Use soap and clean water. You can use hydrogen peroxide or betadine solutions instead of soap. Make sure you rinse the area really well with drinking water after. Allow to dry. Don’t cover with bandage or tape and keep flies away. Dry savlon spray with iodine for example is really good to treat the area with throughout the day and evening. If despite this the area starts to become swollen hot and red you need to start applying antibiotic cream, and if that doesn’t sort it out you should considering tapping into your precious anti-biotic supply. Co-amoxiclav, flucloxacillin or Penicillin V should work fine. If it doesn’t you may need to go somewhere they can put antibiotics in your blood. Not all urchin spine injuries end in horror! They can quite commonly pierce the skin, and after cleaning, not cause much of an issue (apart from marks). If you think that this is the case, you should apply common sense and not butcher yourself with a needle/knife trying to get them out. This may only serve to guarantee infection later down the line, and theres no guarantee either that you’ll get them all out. Not all spines cause a problem. Removing these 3 would have caused significant trauma to the skin & really increased the chance of infection. Vigilance is the key, to watch for early signs of infection. WHAT DO I DO IF I WANT TO GO BACK IN THE WATER? If its an area of likely friction or abrasion try and tape it to help reduce damage to the area. When out of the water repeat the scrubbing step described above. Use your common sense as to how aggressive you should be. I find that the new ‘second skin’ ‘breathable plaster’ sprays are great for these sort of injuries when you’re going in the water. Some contain antiseptic. Cake the area in the stuff before you go in the water, and after you’ve cleaned them. Oh, and they may sting a lot when they go on! If your digit starts to look like this (below) you need to start taking antibiotics or get yourself to a doctor to get them. Even if you do have antibiotics, bear in mind that if the bone gets infected you still need to go to hospital for antibiotics in your blood. Its hard to diagnose bone infection clinically. The pain will be bad, and antibiotic tablets won’t help much, if at all. Its diagnosed with X ray.